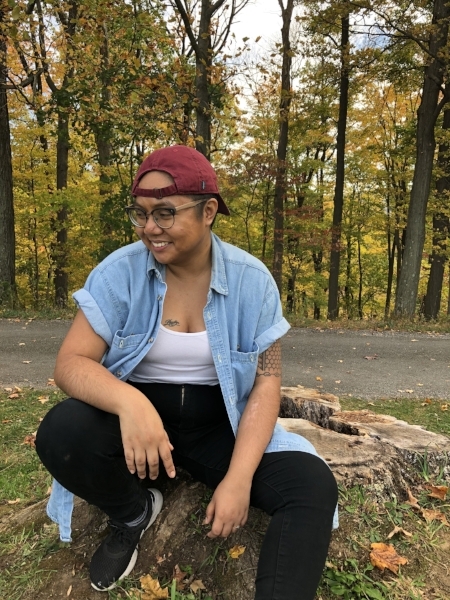 "In the In Between" is AC Dumlao’s new monthly Hella Pinay column on what it means to be (in(side) the) in between of two places, identities, concepts, constructs, and more. October 2017’s column is on being Filipino and American in honor of Filipino American History Month. In elementary school, I had to write about my favorite food. I chose kare kare, to which my teacher and classmates required explanation. “I’ve never had oxtail…” “So it has peanut butter in it?” I felt different. Singled out. Annoyed. I thought if I ever had to write about this again, I would pick pizza. Being Filipino-American isn’t as obvious as loving kare kare and pizza. And this isn’t the coming-of-age story of “I knew I was different” from a young age then persevering into the confident self-actualized person I am today. It’s still complicated for me. When Filipino History American Month rolls around in October I am filled with pride, but I also experience discomfort and shame. I don’t know Tagalog, I went to the Philippines once when I was eight years old, I have only recently begun to educate myself on my heritage, and because of that I often feel like I am not a “real” Filipino. That I don’t belong writing here at Hella Pinay. 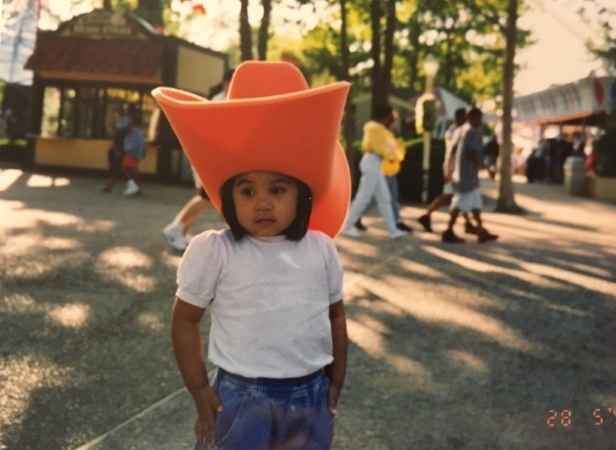 I grew up in the suburbs of Long Island, born to Filipino immigrants. While my weekdays were spent at Catholic school with my (majority Italian and Irish Catholic) white classmates and teachers, on the weekend, I went to “Filipino parties” at my parents’ friends’ houses and ate Filipino food with a big scoop (or two) of rice for dinner. I heard the cackles of our mothers gossiping in Taglish while our dads relaxed in the backyard drinking beers being cooled in a baby pool. There was line dancing, karaoke, and extra crispy skin on the lechon. At school, I was one of few brown faces, but on the weekend I was one of many. Even within the haven of my Filipino weekends, I didn’t completely fit in. I felt embarrassed that my Filipino friends could speak Tagalog but I couldn’t. “Your parents never taught you?” I was asked this by the other kids my age and their parents. It was confusing. Why didn’t my parents teach me Tagalog if all the other Filipino parents did? In adulthood, I took a beginner’s Tagalog class and picked a little bit up, but the path to fluency is long and I may ever reach it. I still feel self-conscious when someone finds out I don’t speak Tagalog (and don’t get me started on the white men who speak it at me). The reason my parents gave me for only teaching me English was that they wanted me to succeed in school. Obviously, studies show that children learn languages easiest when young, and that multilingual children have many advantages. But for what it’s worth, I did excel in school, and English was one of my best subjects. I even thought I’d be an English teacher when I grew up. Within that, though, a sort of similar shame came about when it came to my accent. I learned to pronounce certain English words with the “wrong” inflection, learned from my bilingual parents. I still do. I say “milk,” “comforter,” “buffet,” and “drawer” differently than what would be considered Standard American. I’ve had strangers and even my partner playfully make fun of me when I mispronounce a word. It stings. Even today, when I do public speaking for a living, somewhere in the back of my head, I feel like a faker. So I try to fit in. I overcompensate my American-ness, or perhaps not just “American-ness,” but a trying-to-be-whiteness. (Not that I’ll ever look or pass as white. My wide nose and brown skin guarantee that.) Behind my “proper” English, my big vocabulary words, my practiced speeches, I hope that I can prove to a (white) audience that I am worthy of being listened to, of learning from. I try to emulate the confidence that I imagine a white person is, well, born with. Of course, white doesn’t mean American. My ancestors’ Spanish colonizers were white. But it’s hard to separate whiteness from the concept of Americanness, especially in this current administration. I have to remind myself: I am American because I was born in America. I’m far from proud of our president or for our country. But being American isn’t part of me that I can erase. It’s obvious for me to say, but sometimes I have to remind myself: even though I am not white, I am still American. Just this past weekend, I seethed listening to a group of white women speaking about their upcoming vacation in the Philippines, only reminding me how I haven’t been back to the homeland in 18 years, how I’d like to have a re-do. I felt so much shame during that trip to the homeland in 1999. Not only was I the American “with money,” I didn’t even speak Tagalog. People always ask me if I’ve been to the Philippines. I tell them a quick, “I went when I was eight...” and then something about saving up to go back. In truth, my memories of the Philippines are uncomfortable. I felt awkward, out of place, while at the same time, for the first time, in a country where everyone looked like me. So other many things come to mind when I think of my Filipino-American experience: Of cab drivers playing a guessing game with me about my ethnicity (“Thai? Spanish? Oh… Filipina… I thought you were Filipina…”), of the angry white man who told my ninang and mom to “GO BACK WHERE YOU CAME FROM”, of choosing to have a Sweet 16 instead of a debut, of Lea Salonga being idolized as much as Whitney Houston and Celine Dion in my household. More sub-betweens for future columns. Today, I am more able to accept that my not speaking Tagalog isn’t a deficiency I have or the fault of my parents, but rather a common occurrence for children of the diaspora and immigrants convinced that to succeed in their new country their children must be perfect in the eyes of their colonizer. And that’s a hard pill to swallow. It’s filled with intergenerational trauma and brings up wider, deeper feelings than just a young first-generation American not being able to speak their mother tongue. It’s bigger than me. But instead of fighting against this pain, I try to flow with it. I yield to it. I accept that who I am is complicated in ways far beyond my worldview and lifetime. This kind of acceptance folds into my practice of daily self-care, of accepting myself where I’m at and building from. Where is that? I think that’s the in between. Or something close to it. It’s the liminal space between Filipino and American which can convince me that I’m not enough of either and that I never can be. 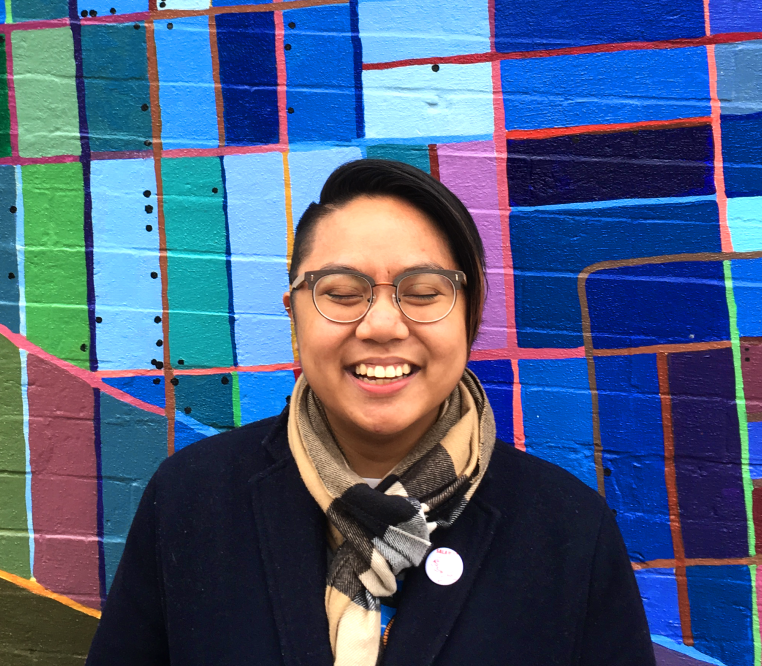 My being Filipino and being American do not exist without me also being queer and non-binary and so many other identities. But those are topics for another month, which bring up their own in betweens to explore, if you’ll have me. I’m excited to continue this journey with you.